When we got into Richmond today we met the coolest people! Check out their website: Tricycle Gardens If we'd had more time we would have gotten our hands dirty. Can you believe their name??? If you click on the link above this pic you will find some VERY interesting information about the Grace Church in Yorktown, specifically about the cemetery there and the people buried in it. 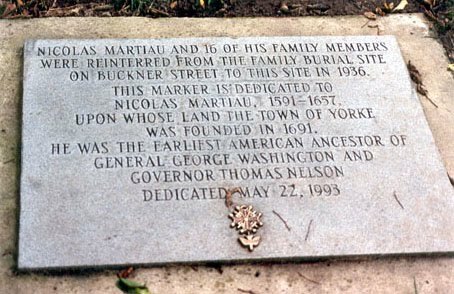 Nicholas Martiau, the Father of Yorktown, and the earliest American ancestor of George Washington, also has a memorial there. See pic. Use the brakes when you want to stop a TerraTrike - unless your name is Flintstone this is what happens when you try to use your feet instead. Ouch. But he was tough and we kept riding... The traffic thinned out and we went through Jamestown and after 49 miles spent the night at the Chickahominy Park on the James River. Our first night in our new tent and we had to set it up in the cold and dark, and we discovered our sleeping bags had gotten wet when it rained in Yorktown. Yeah, it was a long, hard day. The next morning we got an early start and found this bike trail along side the road. A NICE surprise! Sure beats sharing the road with cars and trucks. See how green everything is starting to get? We found THE BEST restaurant in Charles City. If you are ever in this neck of the woods, you MUST eat here! Everything was soooo good and the service was SUPER! This church was used as a field hospital during the revolutionary war. Now they host cyclists! Juanita lives next door and we really enjoyed talking with her. She and I had LOTS in common and I will always remember her. Across the street from the church was this Veteran's Cemetery. This morning the pastor, Hugh, and his secretary Nancy came to the church. Hugh took my trike for a spin, we told him about our ride and about Alex and they prayed with us before we left. NICE people. We sure appreciate their letting us stay in their church through the big storms! Yorktown marked the official start of the TransAmerica Trail portion of our ride. I mentioned our wonderful accommodations before, provided by Elsa and Carlton from the Grace Episcopal Church which has been there in Yorktown since 1634. Here is the church and the house we stayed in. Tires dipped! Time to RIDE! We have so many pictures and stories to share with you! Unfortunately internet access is a rare thing out here in the "wild" so we can only blog once in awhile. Today I have been blessed with the use of the Willis United Methodist Church's computer here in Glendale, VA, (thanks Juanita!) so I thought I'd at least update you verbally even though I can't share any pics yet. I am not sure what I was expecting when I committed us to place ourselves at the mercy of the world like this, but over and over already I've experienced MORE than I thought I would. MORE of everything. It's harder than I thought it would be but it is also more exciting and rewarding and fun than I imagined from the comforts of our house. The kindness folks have shown, especially those who open their doors to cyclists, is astounding. They have guestbooks for us to sign and reading the entries of those who have come before us is a true treat. It makes me eager to get moving again (after the rain) and grateful to be warm, dry, and fed here at the church. This service they provide to us wandering types is truly faith in action and boy is it ever appreciated. I think their trust and generosity is perhaps what has affected me most at this point in our ride. We are just beginning and already I feel a renewed sense in the GOOD in people.. I feel the love, and I feel it MORE. Ken and Lee setting our stuff back up. In the background is the truck our trikes got to ride across the bridge in. Simon rode inside with us of course and took a little nap. On the beach in Newport News. As you can see from the picture below we did make it to Yorktown and thanks to Elsa and Carleton from Grace Episcopal Church we have the most amazing accommodations. Words cannot express how nice this little house on the water is, nor can they describe the kindness these folks extend to cyclists. Check back tomorrow. As tradition goes, we will be dipping our tires here in the morning, weather permitting of course! This is the where the trip really starts!!! We went just 21 miles on Wed but that was just fine with us because we found a great campsite in the middle of nowhere, right next to a lake. The Butler campground has been a part of their family for a long time and their entire farm has belonged to their family for 5 generations. We really enjoyed how peaceful it was there. At night you couldn't hear a single car in the distance. Pure quiet, other than the sounds of nature, of course. Using Dr Bronners awesome soap and the sink in the bath house we were able to get all our laundry done. We had a perfect breeze to get everything dry and smelling fresh, which anyone who has done a ride like this before knows is a real treat! We also aired out the tent. We have to get a new one very soon. Ours ripped and it leaks. Beautiful Virginia farmland sunset view from our campsite. Today we went 33 miles and are now resting comfortably at HOME - the EconoLodge in Suffolk VA.
My guys. I love them both so much. I found an alligator in the swamp! This is a BEAUTIFUL Methodist Church we stopped at today. The photo just doesn't do it justice, especially the stained glass. Our camera batteries died right after this shot, so it's the only one we got. It's a small sign and we were on such a rural a road that didn't even have a center line. In spite of getting a late start due to the rain, and in spite of the heavy headwinds we somehow managed to push out 33 miles today. I yelled WOOHOO out loud when I saw the motel sign. I missed "talking" to all of you! Two! Two? How Did We Get to Two Already!!? Such a Beautiful Day to Ride! What is an "Old Soul?"